Other people can be given Catalonia’s Excursion Center. 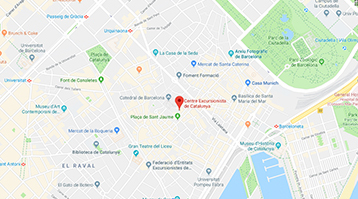 Safekeeping the Temple of Augustus [1st century AD] we find the Excursionist Center of Catalonia, entity with more than 140 years of experience in scientific and cultural excursions. Among its most notable members are Josep Puig i Cadafalch, an architect by profession and a vocationist, thanks to him and the Catalan Association of Scientific Excursions, he discovered the site of Ampurias, finding the best preserved sculpture of the god of medicine, Asclepio. The first members sought to recreate, plan and project the Catalan territory, using the excursion as a means to achieve the goal of knowing and publicizing Catalonia. To attend the "Guided Tours to the Catalan Excursionist Centre" will have to make the reservation and the payment. They can give other people Guided visits to the Catalan Excursionist Centre, gifts can choose the day they wish to enjoy the experience within the dates of the activity.